The Hometown Hero Banner Program is a tribute to veterans, those currently serving, and first responders with connections to Northumberland County. Banners are displayed on streetlights in downtown Sunbury and along Front Street as living memorials to the men and women from our community who serve/have served our country. Each banner is unique and honors a specific hero including their picture, branch of service, era of service and hometown. This program is non-political and non-partisan. 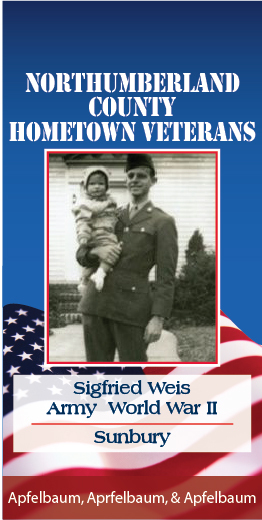 If you are a Hometown Hero, or would like to honor a Hometown Hero as part of this program, please complete an application and mail it to the SRI office (address listed on form). The deadline for 2019 submissions for NEW banners is April 1, 2019. Banner displayed in 2018 have been removed. If you would like to rehang your banner in 2019 please print the application and mail it, along with you payment, to the SRI office. We will clean and store your banner until it is rehung in Spring 2019. If you prefer to pick your banner up, please contact the office to make arrangements. Please contact SRI at 570.286.7768 if you have any questions about this program.